After an impressive performance in a loss to Italy in their first World Cup appearance, Ghana would realistically need a win if they were to keep qualification to the round of 16 in their own hands. The Czechs were coming into this game on a high after a comfortable 3-0Â win over the USA where, Arsenal’s new signing, 25 year old Tomas Rosicky impressed with two goals, one being a screamer from long range. The Czech Republic started in a 4-1-4-1 formation with the 6 ft 5 striker Lokvenc upfront and a midfield four of Plasil, Nedved, Rosicky and Poborsky in support with Galasek sweeping up behind. Ghana started in the 4-1-3-2 formation they used against Italy with Otto Addo, Illiasu and Mohammed coming in for Eric Addo, Kuffour and Pappoe. Ghana’s early goal came before the match had really settled down into a rhythm. Appiah swung the ball in from a corner which Cech punched out, it came straight back to Appiah who, with a great piece of skill, flicked the ball over Rosicky’s head to send a ball into the box – Ujfalusi horribly missed with a diving header, the ball falling to Gyan who scored from a left foot finish for Ghana’s first ever goal in the World Cup finals. Ghana almost scored another after Appiah came deep to get away from the poor Galasek, who left masses of space when following Appiah for Amoah to drop into but he shot wide. After the highly entertaining start a pattern started to develop in the game. Although 4-1-3-2 is normally good for pressing, Ghana didn’t and their two strikers came deep to cut balls out into the midfield. The Czechs, who were starting to dominate possession deep in midfield, were launching balls early to Lokvenc and trying to get the four players behind him in support even though they had two playmakers in the middle who could manipulate the ball in more advanced areas, especially since they had a spare man in midfield and single holding midfielders can be isolated. Ghana’s three attacking midfielders were too wide to stop balls coming through the middle and the team as a whole were struggling to keep the ball, however the fact that they left two upfront left Ujfalusi and Rozehnal nervous as they both had pace to get in behind them. Ghana always looked like they could score on the counter as Galasek had an awful game for a holding midfielder: hardly cutting any passes out, marking Appiah poorly and not protecting the back four at all. The long balls to Lokvenc started to work a few times as he was able to lay the ball off occasionally to Plasil and Poborsky who narrowly shot wide. Both wide midfielders got some joy in the first half as Ghana’s full backs were largely unprotected and were able to get some good cut backs in, but their teammates couldn’t get on the end of them. Both teams made a single change for the second half, Jan Polak coming on for Galasek and Derek Boateng coming on for Otto Addo. Czech Republic seemed to have changed tact and had stopped the direct balls to Lokvenc but Ghana were still getting chances to counter, a highlight being when Amoah found himself in space deep in the Czech half, gave the ball to Gyan, who then carried the ball to the edge of the box drawing three defenders with him with Amoah to his right, who would have had a clear shot on goal had Gyan not chose to ignore him and shoot wide. One of the main reasons for Ghana having so much space on the break was the fact that the Czechs had many bodies high up the pitch looking for the equaliser but hardly put any pressure on the ball when they lost it. 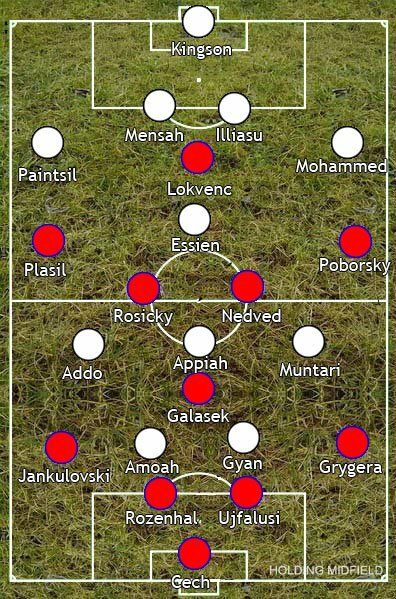 Although having the ability to play up front, Bruckner sent on Stajner for Poborsky in a straight swap but Nedved moved into a position immediately behind Lokvenc with Rosicky moving into a deeper position alongside Polak – although Rosicky and Nedved would often switch positions from then on. However the Czech Republic’s attempts at an equaliser would be further jeopardised as Ujfalusi conceded a penalty and got sent off from another Ghana counter attack – the Czech back four was exposed since the second holder alongside Polak, although being in that position, normally made no effort to track any runs and was therefore useless defensively. After Gyan, as if a rehearsal for the quarterfinal against Uruguay four years later, hit his penalty onto the woodwork the Czech’s changed shape to a 3-2-3-1ish shape when they brought on Austria Wien’s Libor Sionko on for Plasil. Grygera, Jankulovski and Rozehnal operated as a back three with Sionko playing deeper than Stajner on the opposite side. Ghana brought on Addo for Amoah to move to a 4-2-3-1 shape as Addo played alongside Essien. With Czech Republic still pushing for a goal, their back three looked very stretched and Ghana scored what would be the winner. They again found space on the counter as Gyan, Appiah and Muntari worked the ball around the edge of the box for Muntari to smash home in the top left corner. The Czechs really struggled to get and keep the ball, the game ended 2-0 for a historic moment for Ghana in their first World Cup win.